Earlier last week, I saw a Facebook post from the granddaughter of my step-mother in heaven. The baby girl that I first met when she was an adorable three was turning 30 as a beautiful, married woman. I thought to myself “how can that possibly be?” followed closely by “holy smokes, I am getting old.” LOL. And then a few days later, I turned 58. The math is beginning to make sense. I am now at the age where both 30 and 40 something women are pups! So what is a girl (okay, mature woman) to do? I decided to look forward at the inspiring women who are walking in front of me rather than behind. It didn’t take long before I decided to chase the amazing Dame Helen Mirren. So here is a 73-year-old woman that truly makes me unafraid of getting older. It should make all of us unafraid no matter how old or young. She shows us that beauty is really about spirit, vitality, and the expression of ourselves with care and creativity. It is not difficult for me to be drawn to or inspired by this contagious energy. So, what are the lessons that we can all learn from Dame Helen (DH) that we can all add to our own every-changing style repertoire? Confidence is the absolute most beautiful thing on a woman and Helen seems to have no shortage of it. DH always seems to have an inherent sense of joy and ease about her which can only come from one place...inside. Most of the images that I see reveal dazzling smiles and playful poses...making everything she wears that much better. My goodness, she is 73 years old and she is rocking pink hair. My hero. You can ask any one of my close friends and they will all tell you that I am at my best when I am confident yet playful. Truthfully, I forget that more than I would like to admit. DH (and my good friends) again remind me just how important a bright smile and a playful spirit can be. Two things I have noticed about Dame Helen is that she is not afraid of bold accessories or a bold color. Clearly bright colors suit her and they seem to transform her classic looks into something unique and memorable. Simple, classic, bold and beautiful. Another great go-to look for us mature gals is a tailored suit, crisp shirt, and a bold lip. And again, back to lesson #1 and #2, DH adds a confident stance, warm smile and quirky hat to finish off this look brilliantly. Every mature woman will benefit from having a few suited looks in her wardrobe. Dame Helen is a master of finding interesting ways to cover up those places - arms and knees in my case - that show the most signs of aging. Modern little jackets, shrugs and sheer tops provide great coverage for the arms. While slacks, long dresses, tights and leggings do the trick for the knees. DH always looks fierce and modern but never like she is trying to compete with the young. DH also has this knack for mixing things up and having a bit of fun with her wardrobe. Below she wears a beautifully adorned skirt with a simple cashmere sweater. Fabulous. As one of the beautiful side benefits of being older, we no longer need to dress to “fit in” or to prove ourselves...we now simply need to dress to be joyful, playful and full of vitality. Cleary DH prefers classic and sophisticated lines, but she remains modern by adding an element of creativity and fun to just about every look you will see her in whether walking the street or at a red carpet event. I love this figure-flattering fitted long jacket opened up at the waist paired with a pencil leg pant and a reasonable heel. And of course, once again, her joyful, playful nature. A great look to be had by all! So armed with my DH lessons learned, I now wander through our clothing channeling to myself "What would Dame Helen wear?" Since holiday collections are arriving daily, I can’t help but be drawn to the party wear that is calling my name. A few other options that seemed to channel the DH vibe are a metallic holiday suiting and a sequin animal print gown, both again by Rachel Zoe. As soon as I saw this rayon and viscose hyper blue blouse and trousers, I immediately imagined both myself and DH wearing these pieces. A classic but bold silhouette that is ready for work, happy hour drinks or a party atmosphere. Easy to wear together, alone or paired with a jacket; or separately with a sweater like the one shown above. This color (DH Lesson #2) is so flattering on most! And as they say (at least in my family) go big or go home! Modern jackets and suits are also our friends (Lesson #3). And in particular, I am loving the velvet royal blue jacket from L’Agence and an easy yet sophisticated suiting from Lafayette 148. Both of these provide easy, not-trying-to-hard elegance...and that seems to describe my fashion icon perfectly. Another great piece that caught my eye while I was wondering "What would Dame Helen wear?” was this sheer metallic animal print blouse. How beautiful would this be over a sleeveless black tank, dress or jumpsuit? Allowing us to show some skin but also hide in plain sight. For a more casual yet festive look, I would grab a pair of L’Agence leather or denim jeans, add a fun bootie and throw on this metallic top with a tank underneath! If you haven’t stopped in to try our exclusive line L’Agence, I would highly recommend that you do. We have fitted these jeans on my 22-year-old daughter and all through the ages including our beautiful 70 something clients. Everyone agrees this is one of the best fitting, most comfortable and flattering line around. And finally I can see Dame Helen (Lesson #2) incorporating this beautiful, inspiring and bold handbag into her wardrobe. Feast your eyes on just one of the Kooreloo New Yorker Bags that we just received. They are spectacular and playful. This multicolored woven fabric bag has an embellished flap front with six logo-etched goldtone coin charms. It can go seamlessly from day to night. And when opened... each unique Kooreloo bag reveals an equally awe-inspiring secret that emits the inspiring energy of the Goddess Athena. Athena represents the importance of transforming ourselves into something new and taking on beautiful new forms over time. And that is really our story as women, isn’t it? This bag and its inspired lining featuring Athena give me the same kind of inspiration that I draw from Dame Helen Mirren as I move forward in age and life. You and I are on an ever-evolving journey so why not do it with a little creative flair, modern style, and a playful spirit? Here’s to you, Dame Helen Mirren. I can’t think of a better style icon to chase! 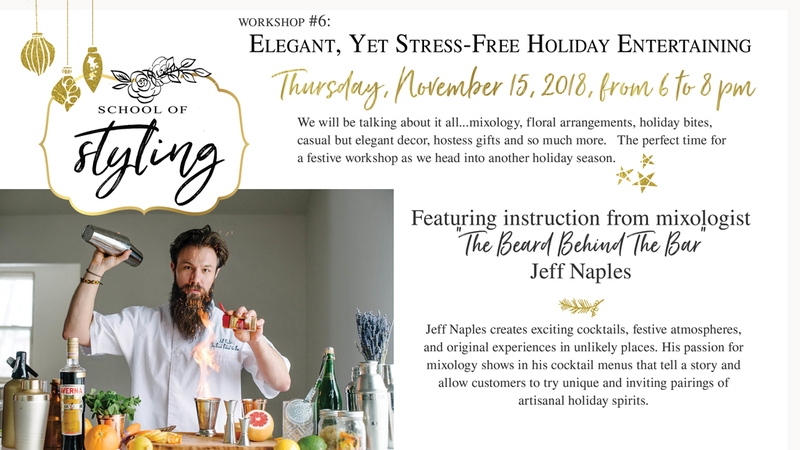 Our final style workshop for the 2018 season is the perfect way to officially kick off the holiday season!